OnLocationVacations.com has some exclusive spoilers and behind-the-scenes FRINGE photos. The crew were in Upper Manhattan, NY filming scenes for Episode 103, and spoilers include the episode's title and some news about one of the characters. Exclusive Pictures from the Set of Fringe and a Major Spoiler! 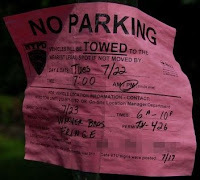 We were on the set of Fringe at the Trinity Cemetery in Upper Manhattan on Wednesday and got some great pictures! When I say we were on set, we were literally on the set. We got into the cemetery before they closed it to start shooting so we had a great view. I will say there were a couple PAs who were less than impressed with us taking pictures and even scolded us at one point but that didn’t stop us from getting a few awesome shots! The scene they were filming was for Episode 103, titled The Ghost Network. It was mostly dialogue between Kirk Acevedo’s character Charlie Francis and Anna Torv’s character Olivia Dunham that took place right after a funeral (more on that later). It looked like her character is upset with him and he is chasing after her, they argue and then Lance Reddick’s character Phillip Broyles walks up and breaks things up. You may recognize Lance from The Wire (there were a few people watching from the sidewalk who were big fans of The Wire and excited to see him) and Kirk Acevedo may be familiar from Oz and The Black Donnellys. We also sensed there may be some sexual tension between Charlie Francis and Olivia Dunham. I was there for only one reason, Joshua Jackson! Of course this was the one scene he wasn’t in. I knew it was a bad sign when we walked by all of the trailers and all of the characters names were written on the doors, except for his character, Peter Bishop. That’s alright, I’ll get him someday, after all I do know where he works! Now onto the big spoiler! In the background of this scene there was a casket set up and a large “tribute” photo of the dead character next to it. We were able to zoom in on the picture and see who it was. It was Mark Valley’s character John Scott! You can see a close up of the photo below. Assuming he is really dead, he didn’t last long, huh?